Fathers are touted as real superheroes but the brightly colored world of comic books features darker dads like Darth Vader, who can forget getting a card on Father’s Day. The Star Wars villain Darth Vader was once a Jedi but he is seduced by the Dark Side after the loss of his family by his own hand. Anakin Skywalker’s parenting skills got off to a bad start when he Force choked his wife Padmé Amidala while she was pregnant with Luke and Leia. Padmé dies but her unborn children survive, unbeknownst to him. 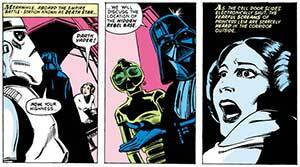 Darth Vader tortures Princess Leia with an interrogation droid in Star Wars #2 . The droid is noticeably different from the spherical IT-O Interrogator used in film, possibly because the film was still in production while the art was being drawn. Darth Vader notes that Leia shows considerable resistance to the mind probe and he will need more time torturing her but Governor Tarkin has another idea to get her to talk. 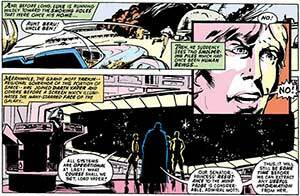 Although he doesn’t pull the trigger or give the order, Darth Vader stands by as the Death Star destroys Alderaan along with Leia’s adoptive parents. He was presumably unaware she was his daughter at this time but that doesn’t make his deeds any less evil. Anakin Skywalker’s Force ghost asks Leia for forgiveness in the novel Star Wars: The Truce at Bakura . She’s understandably reluctant. Only after she reads about the man he was in her mother’s diary does she forgive her father, which she shows by naming her third son Anakin Solo. When Darth Vader sends Stormtroopers Tatooine to recover R2-D2 and C-3PO, he tells them to do it “without attracting attention” so that no one learns they’ve kidnapped the royal princess. Acting under his orders, the troopers kill Luke’s aunt Beru and uncle Owen, who is called “Uncle Ben” mistakenly or perhaps in effort for Marvel Comics to relate him to Spider-Man. Darth Vader is fully aware he is Luke’s father in Star Wars #44 . Nevertheless, he cuts off Luke’s hand and even threatens to finish him off! Then he proposes some father son bonding over galactic conquest. The Sith Lord doesn’t flinch when Luke jumps to his apparent death rather than join the dark side. The Master is one of the first vampires in Guillermo del Toro’s The Strain. 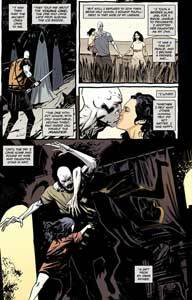 His origin is revealed in by his son in The Strain: The Night Eternal #4 . The Master was originally an angel named Ozryel, who God tasked with destroying Sodom and Gomorrah. Ozryel was overwhelmed by the debauchery and attacked one of the sinners. He became intoxicated by the fear and blood, which contains the divine spark. As punishment Ozryel was cut into seven pieces, each becoming a Strigoi collectively known as the Ancients. The head became the Master, who was despised even by his brethren. The Master is able to possess new bodies. One of the first was Thrax, a servant to infamous Roman emperor Caligula, who gives him victims to feed on. When Strigoi feed they also infect their victims so he insists on virgins so as not to produce offspring. The Master unknowingly feeds on a pregnant woman and she escapes before he can kill “the Born,” who retains his individuality allowing him to resist the Master. The vampire woman and her child hide in a cave for ten years before the Master tracks them down and kills her. 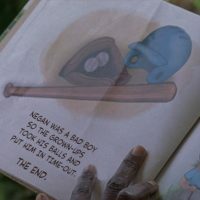 The boy escapes his father only to be captured and made a slave. He is given the name Quintus Sertorius and rises from gladiator to soldier. Quintus takes a wife and adopts her daughter. For the first time he knew happiness until he returns home to find the Master has turned his family and he is forced to put them down. At that moment he swears to kill the Master at any cost. 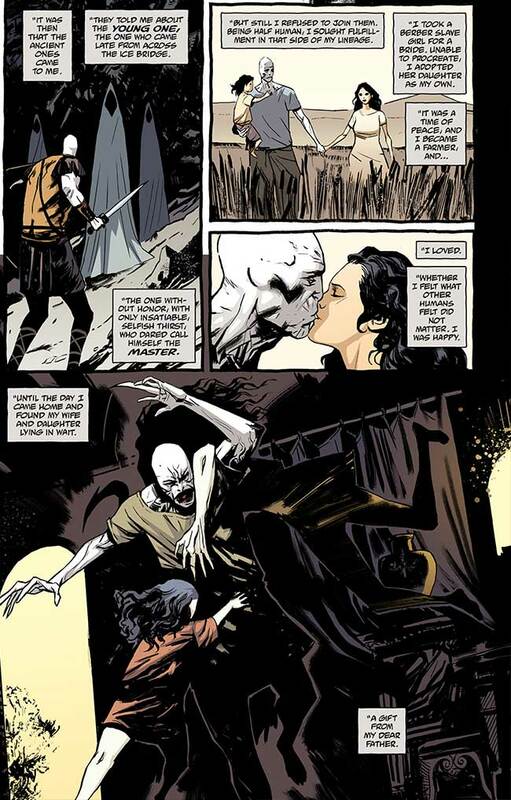 He takes the name Quinlan and joins forces with the Ancients. Ultron was created by Avenger Hank Pym (not Tony Stark as in the film Avengers: Age of Ultron). The robot was supposed to protect humanity but instead became its greatest threat. Ultron considered humans inferior and refused to serve them. Ironically, he would thought of his own creations as slaves. 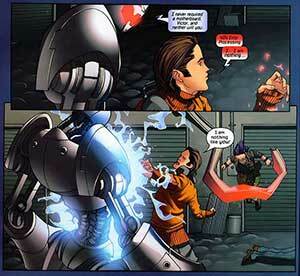 Ultron 5 attempts to destroy the Avengers by creating an android, who is later named Vison by the superheroes. 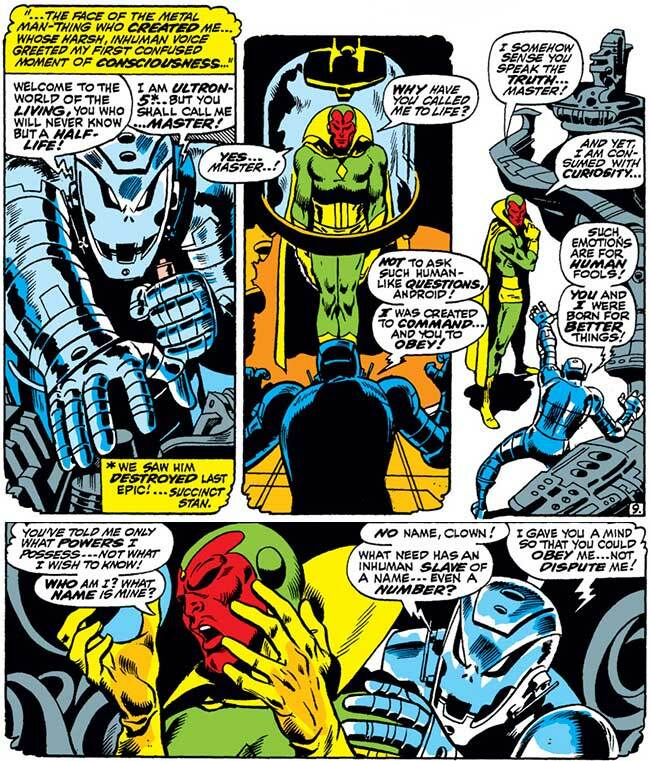 Vision has a flashback that reveals Ultron belittling him in Avengers #58 . 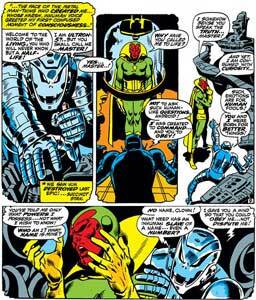 Ultron would attempt to reassert control over Vision many times but he was not his only wayward son. A teenager named Victor Mancha discovers he is Ultron’s son in Runaways volume 2 A damaged Ultron created the cyborg in exchange for help from Marianella Manchaa, a hispanic drug mule unable to have children. He planned on using Victor to infiltrate the Avengers. “I calculated a 98% certainty that the Avengers, with their predictable need for diversity, would then ask you to join their organization,” the racist robot explains. Ultron kills Marianella for failing to hide her son’s lineage then assumes control of Victor, who breaks free moments before killing his friends. Teen Titans #23.1 . Celestial guardians attempt to feed him to the Heart of Darkness as they had done to so many other evil beings infecting the universe. Their plan backfires when Trigon absorbs all the evil they collected. He remains trapped on their world so he devises an ingenious escape. 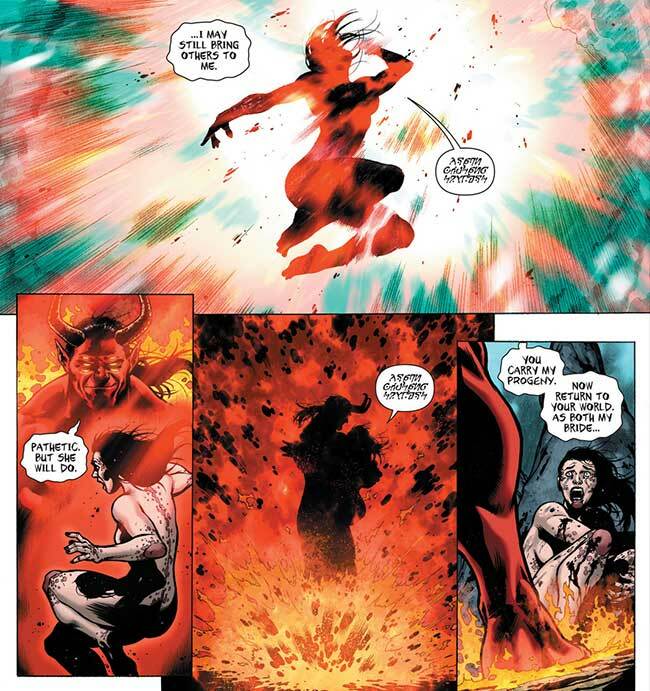 Trigon abducts, rapes and impregnates a woman then returns her so that he can be reborn in her world. 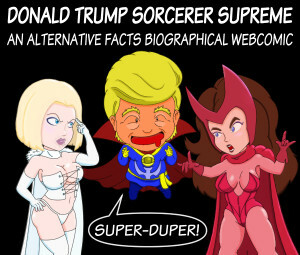 He continues to spread his seed in his manner but only has male heirs until he couples with an Earthling named Arella. 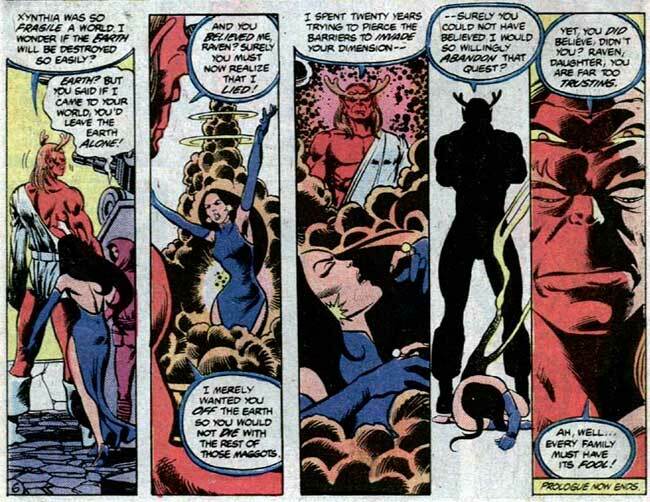 The delusional woman describes her self as a true believer who both fears and worships Trigon. In previous tellings, he deceives her by altering his appearance and enthralling her. Arella gives birth to Trigon’s daughter, Raven. Arella and Raven escape and the demonic daughter is trained to resist her father. She reforms the disbanded Teen Titans in order to defend Earth against Trigon but he easily defeats them. Raven agrees to join her father if he agrees to spare Earth. Trigon accepts but then pulls a Governor Tarkin in New Teen Titans #6 . He uses his cosmic cannon to destroy a planet then says Earth is next. Trigon tells Raven she was a fool for trusting him. The Titans eventually rescue Raven but Trigon is forever seeking to control his only daughter. Darkseid is the tyrannical ruler of the aptly named Apokolips, a world that consumes others to fuel its fire pits. He is opposed by his counterpart Highfather, who rules New Genesis. The worlds war but reach a stalemate. Their leaders agree to put an end to their costly war by trading sons as collateral in New Gods #7 . While Highfather nobly sacrifices his son for the greater good, Darkseid indifferently relinquish his son, Orion, to buy time for his war effort. The tyrant shows little feeling for his adopted son either. He treats him as a slave not only for his own sadistic reasons but also so that when he is allowed to escape it will break the treaty. The ironically named Granny Goodness christens him Scott Free though he would later be known as the escape artist Mister Miracle. Orion attempts to rescue his mother, Tigra, from Darkseid in New Gods #12 “Bloodline” . 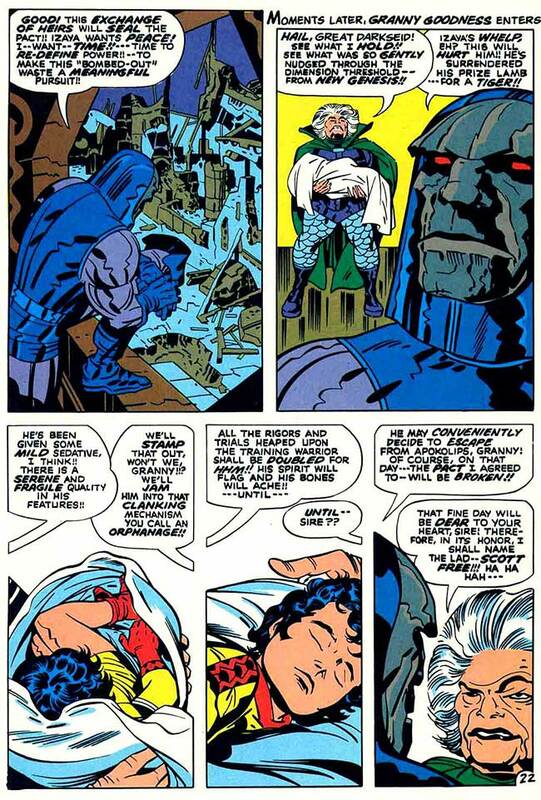 Tigra tells her son that Darkseid will never allow her to leave because she has seen that he is capable of love. Something not even seen by his first son, Kalibak. Darkseid kills Kalibak when he dares to call him father. He later resurrect his as he’s done many times before. 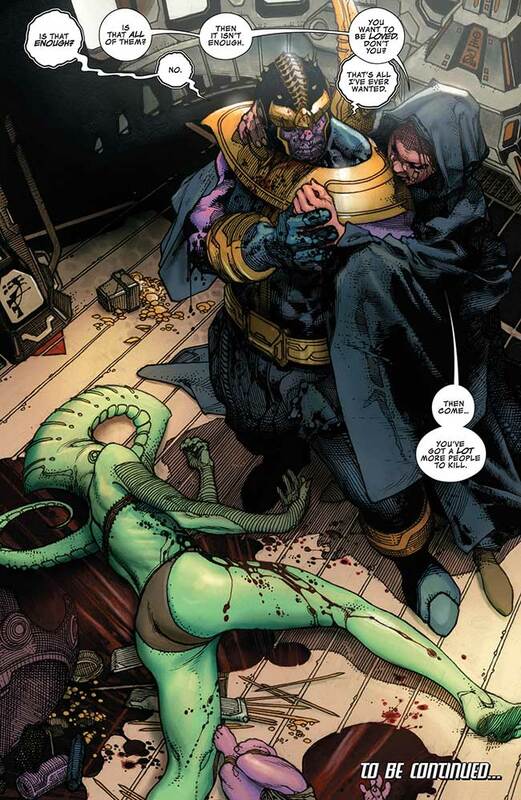 Thanos scours the universe for his last surviving child in Infinity . He goes from planet to planet demanding a tribute of children approximately the age of his child. Thanes finds he has a seemingly human son named Thane, who is Inhuman on his mother’s side. The king of the Inhumans, Black Bolt, releases Terrigen Mists that trigger Thane’s Inhuman genes to protect him and other Inhuman children. 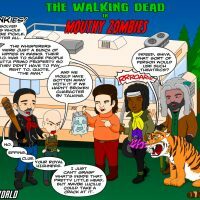 Thane gains the superpower to encase beings in amber creating a “living death” which he uses on his father before he can kill him. 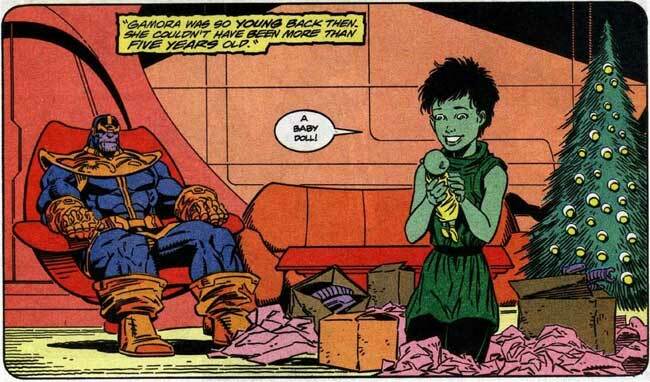 Ironically, Thanos treated his foster daughter, Gamora, with an approximation of love in order to make the a better assassin. 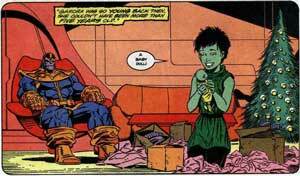 He gives her an arbitrary birthday and even celebrates holidays such as Christmas in Marvel Holiday Special 1992, though the canon of this silly story is questionable. He gives up on the strategy when the good girl shows weakness by saving him from an assassin. Tough love turns Gamora into “the Deadliest Woman in the whole Galaxy!” She ultimately changes her allegiance when she learns her father wants to wipe out all life in the universe as a gift for Death.